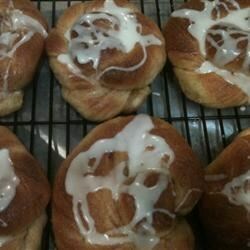 "My neighbor, Mrs. Baker, used to bake these cinnamon rolls and invite me and my children over while they were baking. The smell of homemade cinnamon rolls was irresistible." In a small bowl, combine 2/3 cup sugar, shortening, salt and 1 cup boiling water; set aside. In a large bowl, dissolve yeast in 1/2 cup warm water. Add eggs and the water/sugar mixture; beat well. Beat in 2 cups flour. Stir in the remaining flour, 1/2 cup at a time, beating well after each addition. Mix until a stiff dough has formed. Cover with a damp towel and let rise until doubled, about 45 minutes. Preheat oven to 375 degrees F (190 degrees C). Lightly grease three 8x8 inch baking pans. In a small bowl, combine 1 cup sugar and 1 tablespoon cinnamon. Roll dough into small balls. Dip balls in melted butter, then roll in cinnamon sugar. Roll balls into 4 inch long cylinders and tie into knots. Place knots into prepared pans. Bake in preheated oven for 15 minutes, until golden. Serve warm. This recipe makes decent cinnamon rolls. But, I'll try other cinnamon rolls recipes next time. Lots of steps but worth the work. Made tasty rolls that are not really sticky but were very good. My tasters actually appreciated that they were not overly sticky or gooey. This was unbelievibly easy, and very yummy. I am making this my new go to recipe for cinnamon rolls. Perhaps it is because I live at altitude, the rolls where more of a heavy biscuit than a light roll. I usually have good luck following recipies, but not this time.